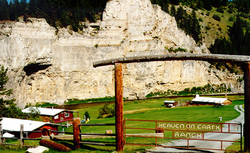 A stay at the Heaven on Earth Ranch will give you a taste of the old West you won't forget. Enjoy a vacation tailored exclusively to the needs of your family or group in a peaceful setting along the beautiful Smith River. If you like to fish, you're in the right spot. Enjoy hours of blue ribbon trout fishing on the river and in the adjacent streams. In addition to unsurpassed fishing, horseback riding, wagon rides, tepee camp outs, target shooting and golf are among the many activities awaiting you. Home of Deep Creek Outfitters, we pride ourselves for exquisite home style cooking, rustic yet comfortable accommodations and above all, service to our guests. Guests are invited to participate in the daily operation of this family-owned working cattle ranch. Or, if you like, you can just sit back, relax and enjoy the scenery. We accommodate only one group at a time therefore your activities are planned specifically with you in mind. .Great Falls is serviced by bus and a major commercial and private airport. We will provide transportation from Great Falls to the ranch.